Each one of people at Ergonomic Concepts is committed to providing the customers with a thoughtful line of ergonomic workstation components that provide the ultimate in comfort, flexibility and functionality. 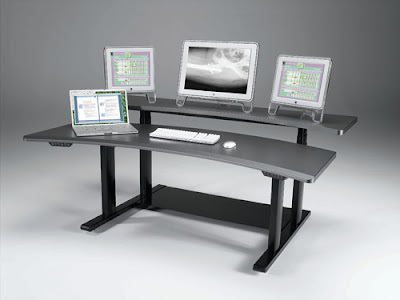 Ergonomic Concepts has a wide selection of adjustable keyboard trays, mouse pads, CPU holders and monitor supports. Each one is manufactured to the highest standards, intrinsically reliable and readily available. They have designed these products with sensitivity to human support requirements. Comfort, flexibility and reliability are three very important aspects of everything they do. Their radiology table design combines stress relief through correct positioning with construction that will meet the demands of an intensive radiology environment. The flat screen support is sold separately. Their ergonomically designed radiology table has been constructed to provide the optimal positioning for intensive use. Personal adjustment can be attained by the touch of a finger, positioning the monitors at the correct focal point as well as keyboard and recording equipment in the correct anatomical alignment. The large concaved waterfall approach surface provides comfortable access to operating equipment, eliminating sharp edges or corners. The heavy-duty construction is designed for multiple shift usage. Cool tips... am gone find some leading manufacture of computer accessories so that I can also organize my office desk. Thanks for this information.